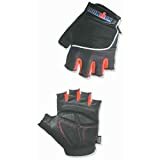 1) I started using Ironman Elite cycling gloves because of their thick padding for cycling but found they worked well when I drove. Also newer Ironman Elite T.2 gloves also work. They make it easier to grip the steering wheel. I have also tried installing a big furry steering wheel padded cover. 2) If you drive a stick shift car, consider trading in for an automatic. We have heard of a guy selling his Porsche due to Carpal Tunnel Syndrome. Buy a vehicle with ‘lighter’ steering and test it before buying. 3) Try to hold the steering wheel in an ergonomic fashion. Hold the wheel at a “5 o’clock” and “7 o’clock” position, so that you can rest your arms on your legs and reduce the amount of grip needed. Verify with local authorities that this is legal to do. 4) Carry and ice packs in an ice cooler in the trunk, and use them during breaks in your driving or when needed. 5) Try to take driving routes that minimize the amount of turning. Highway driving is usually preferred to driving around town. 6) My problems came with poor posture, thoracic outlet syndrome, weak back muscles and pectoralis minor. Adjusting my seat so it was almost like a recliner helped prevent stooping over and rounding of my shoulders. Have your shoulders lean back in your seat and hold your head level, bolstered by the headrest as you drive. Allow the seat to support your weight by angling it to support the weight of your thighs. I use an accessory pillow to increase the height of my seat. Adjust your mirrors after you have customized your seat. This site has additional tips on driving when you have Carpal Tunnel Syndrome or wrist pain. We just went live with our new company and launched the perfect web product for those who suffer from carpal tunnel. The product is called The Palm Rest. It is an extremely useful wrist support device to place on your steering wheel while driving. You rest your palms right on it! We have had recent clinical trials proving that It reduces wrist fatigue and muscle strain by more than 47%!!! You must try this product to see what I am talking about. We’ve had great feedback from many people who suffer from carpal tunnel. Check out our website. Let us know what you think when you get them. We’re so confident that it will help you that you can send them back if your not fully satisfied and we’ll give you a full refund. We check all of our responses, so let us know what you think!! We’re very excited about it! Mike, we recently added a new soft foam pad to our product, The Palm Rest, which helps to absorbs a great deal of the vibration on the steering wheel when driving. Let me know if you would like to try our product and I’ll have a pair sent out to you. I would be curious as to your thoughts. Take a look at our website and click on the ergonomic test results to see how the product relieves muscle strain and tension while driving. You are exactly correct in questioning if some of the damage is already done before a person gets onto their computer at work. According to the company, US Ergonomics, a great deal of muscle strain occurs in the hands, arms and shoulders while tightly gripping the wheel during driving.